These amazing Almost Zero Carb Low Carb Wraps have trace carbs per each and 1 net carb for two. They are gluten-free, and require no specialty ingredients. The Perfect ketogenic wrap! 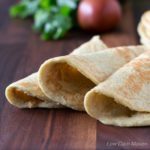 I’ve been on a quest to find the best gluten-free low carb tortilla and low carb wrap recipes. It started last year when I developed a recipe for 1 carb tortillas using glucomannon (Konjac) powder and coconut flour. They’re great to use in enchiladas or to fry as chalupa or tostada shells. 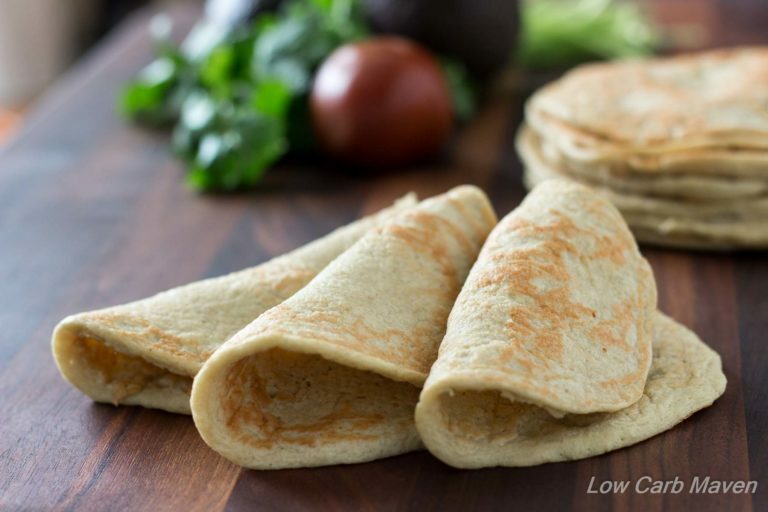 Then, I posted one of my favorite recipes for low carb tortillas and wraps from Maria Emmerich of Maria Mind Body Health. Her recipe, which uses almond flour and psyllium powder, was my go-to for low carb wraps or soft tacos. Next, I shared a fantastic recipe for low carb zucchini tortillas. This recipe has changed lives – for real. All of these recipes are great low carb options, but they require specialty ingredients. This recipe is made from regular ingredients you can find in any store. And it is completely AHhhhh-mazing. These low carb wraps are super easy to prepare. And like I said, are made from regular ingredients, but what’s even better is the fact that they are ALMOST ZERO CARB per each. Yes, really. And two wraps top out at 1 net carb! I know. You’re thinking I’m pulling your leg. Right now you’re probably thinking that this is just too good to be true. I bet you think I am full of baloney; that I just looked you straight in the eye and told you a “whopper”. Nope. These low carb wraps are 100% legit. And, I am so excited! How can this be? How can these low carb wraps be almost zero carb? They are made with pork rinds. Yep. Chicharones. And pork rinds are a great low carb source of protein, contain heart healthy fats, and are full of gelatin. Gelatin, as you may know, is good for you. Read more about the benefits of gelatin in this great article on Chris Kressler’s site. Because this recipe uses no nuts, it’s perfect for the Induction Phase and all phases of the Atkins Diet. This recipe was inspired by all of the recipes for low carb pork rind pancakes and this recipe for pork rind tortillas from The Primative Palate. Go check out their great Paleo site. I like using these wraps for keto breakfast tacos, with chicken fajitas, green chile stew and traditional beef fajitas. These Almost Zero Carb Low CarbWraps are trace carbs per each or 1 net carb per 2. These amazing low carb, wraps have trace carbs per each and 1 net carb for two. They are gluten-free, and require no specialty ingredients. The Perfect ketogenic wrap! Food Processor Method: Place the pork rinds in a food processor and process until they become a fine powder. Add the baking soda and salt and give it a little pulse to mix. Add the eggs and cheese and process until smooth and thick. Add the water and blend until all of the ingredients are completely incorporated. Pour into a bowl and let sit for 5-10 minutes until the batter thickens to the consistency of cream of wheat. Hand Mixer Method: Put the pork rinds into a large zip-loc bag and crush in batches with a rolling pin or the smooth side of a meat mallet. They should be completely pulverized into a powder. Place the pulverized pork rinds into a medium bowl and stir in the baking soda and salt. In a smaller bowl, blend the cream cheese with one egg until combined and smooth. Add another egg and mix. Add the egg and cheese mixture to the pork rind crumbs and add the rest of the eggs. Blend with the hand mixer until smooth. Add the water and mix until thoroughly combined. Let the batter sit for 5-10 minutes until the batter thickens to the consistency of cream of wheat. Preheat a pancake griddle over medium heat. When hot, oil the griddle and then gently wipe-off the excess with a paper towel or spray with cooking spray. Using a 1/4 cup measure, pour the batter onto the skillet and spread into a 5 inch circle with the back of a spoon. Make it as thin as possible. I dip my spoon in water to prevent it from sticking to the batter. Having a cup of water nearby helps. Cook like you would a pancake. NOTE: You will need to thin the batter as it sits. Add 1 tbsp at a time as needed. Keep in the refrigerator up to a week or freeze with a piece of waxed paper between each wrap. Make sure to spread the batter with a wet spoon or you will end up with a thick pancake that will not serve well as a wrap. Thin the batter with a little more water if you notice it getting a little too thick to spread easily. **** I'm often asked how these wraps taste. I use plain pork rinds and think these wraps are very neutral in taste. ***If this recipe is too eggy for you the first time you make it, try using 3 whole eggs, 3 egg whites and 3 tablespoons of oil. No, this recipe can not be made without the pork rinds. That's like making a bread recipe and then removing the flour. Try these alternative wraps, zucchini tortillas, and this savory crepe recipe. Previous Post: « 57 Great Low Carb Superbowl Appetizers! Is the 4ozs of pork rinds after their crushed or bag size mine was runny and looked like crepes. Are the nutritional facts for one wrap or for two? 124 calories per wrap or for two wraps? Wondering if anyone has tried”frying” these in a panini maker? Do you mean to cook them or after cooking, Necia? Can the pork rinds be made from pork skin directly? I make pancetta and always have skin from 12 pounds of pork belly. Just crisp up in the oven i suppose? Hello! Do you know how many total carbs are in one wrap? I was leery of these because I’m not a fan of pork rinds. THESE ARE GREAT! They’re light and moist and if I hadn’t have made the batter I would’t know pork rinds were in there. I made mine with the reduced egg yolks because I was concerned about the eggy flavor. Thanks for the recipe! Well these are wonderful! Tasty but pretty neutral, pliable but sturdy. I made mine in the blender and it worked fine. Next time I will omit the salt but other than that, I love them. In the interest of research, I put cinnamon and vanilla syrup on one and it was yummy 😊. Thank you so much for sharing your recipe and video with us! Has anyone tried these as a pancake with a sweetener, vanilla, cinnamon, and maybe maple extract? How is the best way to figure out 4 ounces of pork rinds when you do not have a food scale? Hi Terri. First, a food scale is a great purchase that will last you for years. I have had mine for over 15 years and I use it multiple times a day. They are fairly inexpensive and I like the scales that have the option to show both ounces or grams. You can get much more accurate carb counts sometimes with grams. What is the serving size? 1 wrap? 2? I usually make this kind of “tortilla” on parchment paper to help prevent sticking on my currently not-so-great non stick pans.. I just made these with an electric tortilla press sprayed with coconut oil. They came out great. I appreciate the recipes, but if these are low carb why isn’t the carb% listed in the nutritional information? Just made these bad boys tonight with traditional beef taco trimmings. My picky diabetic husband approved. Their biggest positive is that they are very elastic, thus they they roll beautifully and hold the stuffing amazingly well. I had only 2 oz bag of rinds on hand, so I substituted the rest with lentil chips –that worked like a charm, recognizing the higher carb content, of course. Next time though, I want to try with plain, not spicy rinds so not to compete with the stuffing flavors. Maybe from the higher lentil chips absorption, but my batter yielded only 6 breads not 12. They looked identical to Kim’s though, which was my goal (not crepes). I bet they will be also awesome with Ethiopian and Lebanese dishes…with Greek tsatsiki,…baba ganouch. Heck, I would even eat them with the cold ratatouille! With The only thing I would like them to be different is to be more chewy…the texture was a bit more like dense pancakes in my execution. Next time I will get more rinds to stay true to the recipe. Great recipe. Thank you, Kim! How long do they last ?? 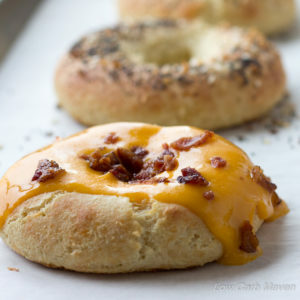 I make everything in batches because it’s just me doing Keto … my fat dough bagels last me about a week in the fridge and they’re a great food prep item… any info on how long these might last because of all the eggs ?? Hi there. I haven’t tried recipe yet but it looks great. My question is do you know the counts if you use your suggestion re not using 6 eggs but eggs, whites and oil instead? This will up the calories, fat I think? Can you advise if you know? I think carbs remain the same? I am wondering do you mean like a bag of pork rinds from the chips section or is there a different cooking pork rind that you intend, I’m not finding anything to tell me that I’m not just heading to the chip aisle. Am I correct? I was wondering how these keep or can you freeze them? I am having surgery in a f w weeks on my foot. I would like to prep as much as I can before hand as I will be nonweightbaring for 3 to 4 weeks. 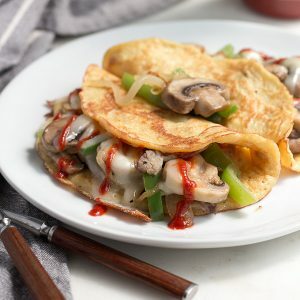 Tried this tonight but, honestly, I found it to be a lot like other keto tortilla recipes I’ve tried. I knew it would be too eggy so I used the alternate suggestion of 3 whole eggs, 3 egg whites and 3 tablespoons of oil. Its certainly easy to make in the food processor and took no time at all. The recipe makes about 3 cups of batter which is a lot so if your only feeding 1 or 2 people you might want to half it. The first tortilla I made worked perfectly but it was very thick, even after using the back of a spoon to spread it. The batter was very thick and it seemed silly to me to try to spread it out in the pan with a spoon so I thinned it with water just as I do pancake batter. After some trial and error I ended up with a thin batter that resembled crepe batter. I put some oil in a small skillet, got it very hot and spooned in some batter. I quickly tilted the pan in circle to allow the batter to cover the bottom of the pan and then cooked it until the edges were crispy and tortilla was firm enough to flip. Using this technique I ended up with a stack of something that loosely resembled corn tortillas. They were still soft and eggy but I was able to fold them around a filling of cooked seasoned beef, cheese and jalapenos to make keto enchiladas. With some avocados and sour cream on top, it wasn’t half bad. Hi Joanna. I’m sorry you found the batter temperamental and eggy. It is supposed to be thick – not like a crepe batter at all. It does take patience and time to spread it out with a wet spoon, but the thick wrap is sturdy enough to stand up to any filling. The batter does need to be thinned a little as it sits while the wraps are being made (perhaps I mentioned this in the recipe?). The collagen really soaks up the liquid! Is there a substitute for the crean cheese? I have a little friend with a dairy allergy. I apologize if this has been asked before. Seems high in fat. Any success using low fat cream cheese? I’m a life long vegetarian. I’m pretty sure you remember Sooze Gibbs (Fluffy Chix) and so many of her recipes used pork rinds too. I was always so sad that I couldn’t try so many of her fun recipes. Then came Gloria’s Soul Bread!! My loaf didn’t work out, think it fell. So I sliced it thin and dehydrated til very dry and crisp. When cooled, I pulsed it in my Ninja til like bread crumbs, then used it in place of pork rinds, AND IT WORKED!! I just wanted to share something with you about my alternative to pork rinds. I’m really excited to try this recipe since I’ve been limiting my carb lately. Just wondering though, could you use coconut oil in place of the oil used ? Would it be an equal exchange? Thanks for your reply! Hi! Just found this recipe and would like to try it this weekend. Just wondering if Eggbeaters can be used instead of whole eggs. I watch cholesterol as well as carbs and calories. I just made a batch following the recipe with 3 eggs and 3 egg whites. They came out perfect! I will be making them on a regular basis. So much better than the low carb wraps in the store. Thanks for a great recipe!!! Great recipe! Just wondering if you’ve tried using sour cream instead of cream cheese. Not a big cream cheese fan.. I’ve made cloud bread with that substitution so just wondering if I could do the same with this recipe… can’t wait to try it!! What do you mean by pork rind ? Is it packet scacking. Thanks for this recipe, since I started on a Keto lifestyle, I’ve been looking for bread substitutes. I like port rinds and always have some on hand. Going to give these a try. I was going to ask you about the food processor in the video but then saw that you hired out the video. Do you have a particular machine you recommend? Tastes like an omelet to me, an I can make egg wraps with nothing but eggs ans save all that extra fat and calories from pork rinds and cream cheese. 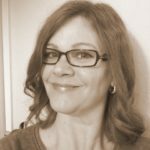 You do realize this is a low carb website? Can whole eggs be used for some of the egg whites? I wasn’t sure I’d like them,so I only did 1/2 batch. I used spicy pork rinds and used my electric krumkake maker to get them thinner, I will be making these again! I’m going to try and use these as pizza crusts rather than low carb tortilla’s. Of rinds in the video (with the rest of the full recipe) and then in recipe, call for 4 ounces– which is nearly a full-sized bag (5 oz.). This needs corrected. Was going to try this tonight, but will not with this huge discrepancy. You have the patience of a saint. I’m a “read the comments” person. Smh. What can I use instead of pork rinds? Thanks for the great recipe – can’t wait to try this tonight. Any recommendations on the best way to store these? I’d like to make them in advance and have them on hand. just saw storage tips below. thanks again! Tried making these last night. Not a fan at all of the flavor, but they definitely would work as a wrap/tortilla. Might try these again if I can find a more neutral flavored base, perhaps coconut or almond flour? You might just have to try different pork rinds. Some have absolutely no flavor, some have a little, some have added flavor. A brand I buy has no flavor, its like eating a crunchy nothing. it’s Mambi brand. Red and yellow bag. Make sure to get the ones that look big and fluffy. I haven’t tried them in this recipe, I just use them in place of chips for guacamole and homemade dips and snacking. If those don’t work try a few different ones. I get these from Publix they do buy one get one free sometimes. Tried these today…major success!! I was nervous because I’m not a big fan of the “porky” taste of pork rinds (I know that sounds silly!) but these cooked up really well and the taste was indeed very neutral. Wonderful texture and a taste you can play with depending on what you want to use them for. We put a little sugar free syrup on one as an experiment and it was quite lovely. I wish I had thought of adding vanilla extract! I’m so excited to have them as a wrap for tacos and my eyes lit up when I saw the comment someone made about making gyros. Thank you for the recipe!! What do you think about using a waffle iron with this recipe? Please let me know how it comes out. I would rather that than Pan cake style… Easier. I haven’t tried your recipe yet but I really want to! I need to buy a food processor and a waffle iron! I lost my old mini processor so now I want a big one! So, this may sound like a stupid question but are you talking about deep fried pork rinds as in the salty snack?? Any clues where to find pork rinds in Aus? I bought pork skin flap from Coles and crisped it in the oven. I’ve ready through many comments & didn’t find an answer so I’ll just ask. How much do these taste like pork rinds? I find pork rinds utterly disturbing lol so I’m worried these will taste like those & be a waste of time & money but would love to try these as I eat low carb and miss wraps/breads. I’m making these as I type this. I already have a few fine and since my chicken thighs are already done I tried one with the chicken and some sriracha. Amazing! I was afraid of it tasting too eggy since that’s alwats my luck so I did what you suggested with only 3 eggs and 3 egg whites and oil. They are perfect! I added a little more water like you suggested to others and it was very easy to flatten by just No big. The pan around. My food processor is very small so I just did the pork rinds in there then the rest on a bowl with a mixer. I ran the pork rinds through twice because after the first time I didn’t think they were powdery enough. Anyways, thanks! I’m new to this and I’m wondering about the pork rinds. The bag I bought is 5oz. Can I put them in my kitchen scale to measure 4oz. Our do I crush first and then weigh? I’m just excited to find recipes that fit the no sugar or bread/carb diet I’ve been on. Shoot! I’m excited to finally find the keto diet! I feel like I’ve been living under a rock or something cuz I’m just now discovering it and all it’s possibilities with food I’ve been missing! Thanks ? So, I’ve never used a pancake pan before (usually my skillet for everything), but because I am gluten free and low carb, I really want to try to make my own tortillas. I want to buy a pan, but I was wondering if a crepe maker would work? I saw some electric crepe makers on Amazon I was thinking about using, but I wonder if they would be too thin then. Do you have any suggestions for the best type of pan? This turned out great. I fried the “tortilla” chips which I think was in-necessary. I think next time I will just let them crisp while I’m baking them with the meat and cheese on them. Was still delicious but they ended up getting a little soggy and I think it’s because I added more oil to them by frying. Can I use baking powder instead of baking sofa? How long will the wraps last in fridg? They last a week, Sherry. Going to try this over week end .will let you know how I did. No more sacrificing 5+ net carbs to have a mediocre wrap. Trying these tomorrow. Hey, what brand cream cheese and pork rinds do you use? Trying to stay as low carb as possible but a lot of the cheeses look to be high in them. My daughter was recently placed on a Modified Atkins diet. These look great! She loves tortillas so I can’t wait to try these! What is the best way to freeze these ?? Airtight container? Vacuum sealed? In a ziploc? Can’t wait to try these out!! In my previous comment I only gave this recipe 2 stars, because, honestly, the result more closely resembles a pork rind omelette than a wrap. One thing I forgot to include in my last comment though: follow the advice to thin the batter to a crepe batter consistency, because trying to use the back of a wet spoon to spread it turned out to be an effort in futility. However, all of this being said, I mentioned in my previous comment that I was going to try to use these for enchiladas. Well, that’s exactly what I did last pm. To my delight, they did NOT disintegrate under the sauce and cheese as I feared they would. The enchiladas actually turned out pretty good. The only downside is that the enchiladas don’t have that familiar corn flavor from the tortillas – which was to be expected. They make a sweet corn extract flavoring on amazon. It has good reviews. I haven’t tried it as it’s ridiculously expensive but it may provide that extra taste you’re going for if it’s in your budget. Hi Tonya. I just saw another blogger post a recipe that uses this. I’ll have to check into it. Thanks for sharing. Enjoy your week. The sweet corn extract is an awesome product! I discovered it when searching for a low carb “corn” bread recipe. It makes a faux cornbread made with almond flour & flaxseed taste exactly like real cornbread. If you want these wraps to have that corn taste, I would suggest adding 1/2 – 1 tsp to the recipe. Annoying response. It is a nice easy recipe. Your rating should be based on taste & performance vs. complaining about the batter mix. I was a bit disappointed by this recipe. It was all good until I tried to spread the batter int a 5 inch circle. I dipped my spoon in water but it still was super sticky and wound up a big mess. Anyone else have this problem? About how long do these stay fresh in the fridge? I’m the only one on Keto in my family so they’d just be for me. Wondering if I should make a half-batch at a time. Is this recipe good for people who have diabetes?? Can these be frozen or refrigerated? If like to make a bunch ahead of time for meal planning. What could you use if you don’t eat pork? Pls keto food, is the cholesterol no too high at 39%. I disagree about the cholesterol. It may not make us fat, but IN EXCESS it is very bad for your heart, liver and pancreas. I think its just important to mention that especially in keto diet. Recipe was simple and came together well. I tried the wet spoon to spread, but that didn’t work so well. what worked best for me was to just use my batter measure…it was all coated with batter, and worked quite well! I do like the taste and texture, was concerned as other mentioned the eggy aspect…but since I like eggs anyway (any way ya can cook em ;-) this wasn’t an issue. Since I am doing Gyros, I added 1/2 tsp each of Oregano, Thyme and Garlic powder to my batter. As a side note, I scrimped on carbs allll day, and i took one for the team. I compared your recipe to the real thing, and in all honesty, I rate this recipe above the real McCoy…..and it didn’t have 30 carbs per. Is there any alternative to the cream cheese at all? I use Kite Hill Almond Cream Cheese and it does awesome in cream cheese recipes without the dairy! I made them today and subbed the cream cheese with ricotta because I was too lazy to go to the store. Worked beautifully! If I left these a bit thicker to cook with less batter per coul they be used as a thin burger buns similar to “thins”? I’ve looked several times at your nutrition label as well as the recipe & while there is a chance I’m simply overlooking the carb count, I cannot seem to find it. Please HELP! Thank you. 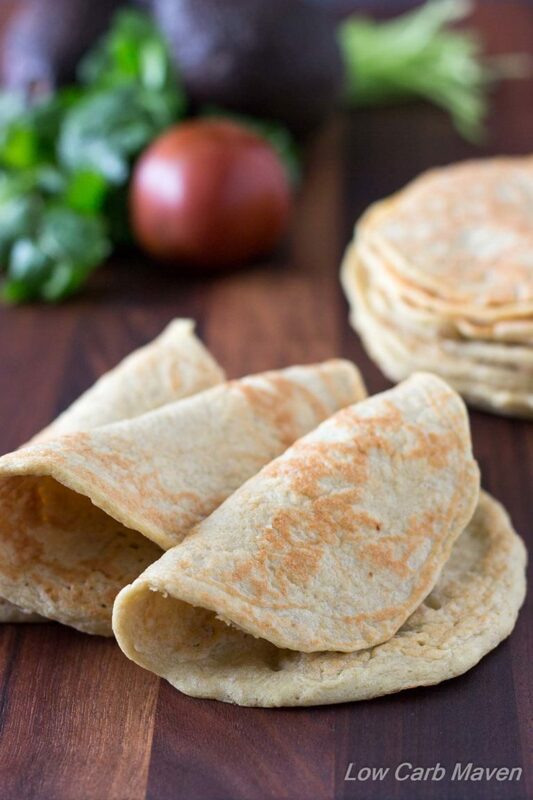 excellent alternative to flour tortillas! Hi! I’d love to try this but I just wanted to see how your pork rinds look like? Does it still have a little fat attached to it or is it just the skin? We have a lot of different options for pork rinds here in the Philippines so I was wondering what kind would be the best one. And, is the one you used salted? Deep-fried or baked? :) I’d like to know before trying. I finally decided to try making this wrap. I must say it was not bad. But, I did have to add a tid bit more water to make sure they came out THIN. I hope to enjoy wrapping them with cold cuts, or other protein. I hope to stay on my quest to lose weight and still enjoy eating well. Thanks for this recipe and your other recipe ideas. I actually used to do this as pancakes with a bit of cream instead of water and sweetener and vanilla. Okay, I tried these again after discovering my mistake the first time as per our email. Granted comma while they aren’t pretty they are awesome! Sorry, that “comma” was supposed to be an actual “,”. LOL! The joys of voice texting. These were really good! I was shocked. When I got near the end of my mixture, I added vanilla, liquid sucralose, nutmeg and cinnamon, and used it to make a few “crepes” for dessert. I don’t detect any porkrind flavour or smell, enough so that I was not at all grossed out and filled those crepes with a cream cheese/whipped cream fluff! Thanks so much! Wow…these turned out great…i used the Aldi brand hot n spicy pork rinds and added a whole new level of flavor. I found if i used a non stuck pan and no oil they turned out better and cooked better. A touch eggy but an awesome alternative. omg while I was making these I kept thinking about my grandma’s cinnamon piecrust strips. So on the last couple I sprinkled cinnamon and erythritol. (I know spelled wrong). after they were cooked I spread cream cheese and whipped hwc and rolled it up. My new go to dessert and great regular wraps! Thank you!!!!! I just made these. They are amazing. Thank you so much for sharing the recipe. They are really good and there is so much you can do with them. Sandwiches, tortillas, wraps…Basically anything you would use a bread with! These are terrific. Easy to make and such a treat to have something to wrap around a hot dog or chicken salad! We don’t get pork rinds in India. Google BAKEN-ETS and you can find them on Amazon or other site and order them. I quickly skimmed through the comments to see if anyone asked about a cream cheese alternative? Need a lactose free option. Thanks in advance! Woah, woah, WOAH. Back up this carriage. Tortillas made with glucomannon?! I can’t find anything on your site anywhere? “make them as THINK as possible”!!! Which is it, THICK, or THIN?? Definitely made me THINK!!! Why does’t it show the carb count in the nutrition chart? So, I made these tonight following the recipe exactly. They did in fact look just like the photo. I felt like they cooked up exactly like thin pancakes. They were very simple & easy to flip once the first side was cooked just enough. My husband said it “Wasn’t that bad, not something I would ever request. But, not too bad”. I on the other hand am one of those people that is very affected by texture when eating. These tortillas were quite spongey or rubbery. I used the 3 egg, 3 egg whites, 1 tbsp. of oil recipe). The taste was kind of like a thin pork rind pancake. So, while I was very excited to try this recipe & hoped it would be a great substitute for tortillas. It doesn’t really work for us. You say to spread that batter as think as possible. Is that thiCk or thiN? Can I freeze these wraps? Are the nutrition facts for 1 or 2 tortillas???? Is that like a whole bag of pork rinds? I’m in canada and my bag says its 70 grams. How long do they stay fresh? Can you refrigerate or freeze them for later? I used coconut cream to make them said free and it turned out great! I just found this and am sooooooo excited to try this. Thank you! Hi Kim, is this an actual pic of the wrap? I made these last night with 3 eggs and 3 egg whites. They turned out really wet and eggie. Any suggestions? Thank you for the reply. I gave them another try over the weekend after I invested in a food processor and they turned out much better! I also like them better once they have been refrigerated for a while. Today for lunch I put one in the toaster oven for 10-15 minutes and used it as a pizza crust and I was soooo happy with it! I think I’ll have the same thing for dinner tonight. I would like to know how it turns out with all egg whites. Thank you for the recipe, Kim, I think I will be making this every weekend. Just an FYI but I reread the recipe and realized I omitted the oil. So I’ll try them again this weekend. Thank you! Hello. I’m new to low carb and I see that pork rinds are used quite often. Honestly, I’m afraid of the flavor. Do you taste pork in these tortillas or anything that they are used in? I had a hard time with these at first. Even after spreading, I still had a pancake. I added quite a bit more water and oil in (eyeballed it, little by little) to thin out the batter and they worked out perfectly. I did think they were a little eggy for use as a tortilla, so I will try using half egg whites next time. However, think the consistency as is, is perfect for crepes. I’m excited to fill and eat them that way. It also reminds me of injera (Ethiopian bread) and would be delicious with Ethiopian food. If you use the egg alternative what kind of oil would you use – olive or vegetable. I am trying this recipe with a Mexican pulled pork recipe on Sunday. This was my first attempt. They were real good but yes, a bit on the eggy side.. so now I have a base line to work with and can tweet it how I would like!! But still good with original recipe. Have you tried replacing the oil or eggs with Flax meal? Kim, these look so good. I’m dying to try these and… I have all the ingredients! Dance party! These are delicious! I was looking for a recipe for a “bread” for a low carb diet. I decided to try this one. I was not disappointed. I did use the 3 eggs, 3 egg whites and 3 T. oil variation. It did not taste “eggy”. Looks like a really neat way to make a flavorful wrap. Can’t wait to try it!!! what is a serving size? Excited to try this recipe!! Will follow up after testing! Thank you for this recipe! Great!!!! I just made these after reading this recipe this morning. I only made half a batch for experimental purposes. I did use 3 eggs for the half batch. #1 was as directed. It had too much of an egg taste to me. All the others had different spices in them and I could not taste the egg. In different ones, were chipotle pepper, minced onions, garlic powder, and Cajun seasoning. Each had only one of those and it picked up the taste nicely. My personal favorite was the one I sprinkled with cinnamon sugar…and again on the other side when I flipped it. It tasted EXACTLY like French toast. I’m going to make another batch and pour it thicker to see what happens. Hi since I’m beginning my low carb journey I can’t wait to try this recipe. Let you know how it turns out soon. wow these look great….is there anywhere to buy them, as I’m a terrible baker and do not know my way around a kitchen? I tried this recipe, but only used 5 large eggs, and I added 2 TSP of olive oil and 2 tbsp of milk. After setting for 5 minutes, the batter was very thick so I added a 1 1/4 cup of water. The wraps cooked perfectly. This mixture produced 20 thin wraps. They hold up well. No breaking or cracking. Because the wrap is thinner, I don’t get the eggy taste. The wrap was easier to spread, by tilting the pan side to side. I made these, they turned out great! Thank you for the recipe! To go with all meat chili for supper. Do you have the nutritional information for these? Is the per serving info for 1 or 2 wraps? I tried these. They are ok, I made the less eggy version and I am very happy about that. Whatever you put in these be sure it is flavorful because the wrap itself doesn’t have much taste. I used my food processor and didn’t really need to spread it in the pan to get that perfect size. While I wouldn’t eat these by themselves (they taste like pork rinds), I made a flat tostada like taco and they were very satisfying and with the meat, a little hot sauce, and some onions, three tacos have me stuffed. I look forward to using the leftovers for a breakfast wraps as I think the rinds will blend VERY well with eggs and bacon. (I wonder if there is a no carb pancake syrup…hmmmm). Hi what can I substitute the pork rinds with? Hi! I’m new to the low-carb thing. I’m addicted to them actually but my husband and I are going to try to do more of a Ketogenic diet to lose weight and feel better and have more energy. I’m very excited about this recipe and I’m going to the store tonight to buy the ingredients and whip up a batch! THANK YOU!!!!!! Mio, they are more like a pancake but are sturdy enough to use as a wrap. They need to be spread out thin so they don’t cook up super thick. I made these the other day. I used the egg and oil version. Fantastic. I also used an 8 inch skillet while still using 1/4 of mix. it made them thin and more the size of a tortilla which works perfect for wrap’s of all kind’s. Thank’s for the recipe. Can I make this without dairy? Just an fyi. Pork rinds are sold in chain markets. You should be able to find them in the same isle as ethnic food’s. Goya product’s, Mexican food etc.. Took me 5 stores until I figured that out. Fantastic recipe. I used 1/4 cup in an 8 inch skillet. Worked great! Can you use something other than pork rind, I do not eat pork. Thanks Linda, so glad I found your website. Not for this recipe, Linda. Sorry. i just finished my second batch of these ,they are well worth the effort to make. could not find 4 oz. so i used 2 3 ‘s along with the cream cheese and eggs as per recipe, only thing is I have to use a lot of water to thin down to pancake consistancy. still comes out great, got 18 out of this batch. gonna have tacos tonight. Do they taste like pork rinds?? Can we use something other than pork rinds? Yuk! if not trying to freeze these; how do you store them? Hahaha! Thanks for the laugh, Dave. Great. Hope you like them! This is amazing recipes and just what I’ve been looking for, thank you. Why does the crepes and wrap recipes does not have the print function? In Australia I’ve never come across ‘pork rinds’ can I either make them from fresh pork skin or order them online? Fellow Aussie here. The most reliable places I find pork rinds are the Asian grocery stores. My local one stocks them by the tonne it seems. They are called pork crackling or chi-cha-ron. They come in regular or spicy/chili varieties, I have never seen plain ones. They regular has ‘seasoning’ though it’s quite subtle and should work (though I’ve never tried cooking with them). I hope that helps. Could you make them withoit the cheese? Can these be made without the pork rind? Hi! The wraps look wonderful. I was wondering if you have tried freezing them? Thank you. Wondering if you think this would be a good substitute for a pita wrap…i have a recipe for gyros I’ve been sitting on for some time with ground lamb in the freezer…now that I’m doing low carb I’d love to finally make those. Based on the pictures it looks like it would work well…I’ve been having a tough time finding pork rinds though! I’m going to have to make a spacial trip as my usual grocers don’t stock them. Im going to try these with the spicy pork rinds. What kind of oil would I use in the substitution? easy. Not to mention extremely good. Thank you! So is this a 14 oz bag of pork rinds or 1 to 4 oz?? How long will the tortillas keep and how do you store them? This looks very appealing. Has anyone fried them to make traditional hardshell tacos? My family would love to have a workable substitute for corn tortillas. I can’t find pork rinds in my grocery store so I bought a big bag of ground pork rinds on amazon. Would love to know the conversion of a ground 4 oz bag into cups or other dry measure. Hi, thank you for this great recipe.. I want to know if there is anything I can use to substitute the pork rinds..? So which version changed lives, with 3 eggs or 6 eggs?? I made these to act as hot dog buns tonight and they turned out great! Can’t wait to try them with scrambled eggs for breakfast tacos and quesadillas. I made the alternate recipe with eggs and egg whites, I used egg whites from the carton. They were a tiny bit eggy when eaten plain, I just wanted to try it by itself didn’t plan to eat it that way, but once I put the hot dog and a bit of chili on the dog I didn’t notice the slight eggy flavor. Thanks for the recipe! My husband has just been diagnosed with type 2 diabetes, and there are no low-carb options in the tortilla or pasta aisles of our stores, so I came looking for low-carb make-your-own. I am definitely going to make these for my husband, who absolutely must have some kind of tortilla-wrapped food at least twice a week. Breakfast, lunch or dinner, it doesn’t matter — he has to have tortillas. I think he would love the eggier version, but I think I’d prefer the less eggy, so thank you for including both. Bless you for creating a recipe that doesn’t require ordering the ingredients online, paying a premium price and waiting for delivery! Aren’t pork rinds the absolute best? After I make these and my husband and I try them, I’ll be back to let you know what we think. Thank you! I do the Diet Doctor already, and I’ll check out the others. Why baking SODA rather than POWDER?? Just curious.. I am super excited to try your recipe, but I had a question. I am not a super big fan of the fatty burned taste of pork rinds, and I was interested in what you thought the finished product tasted like. How much of it do you taste, and do you think it would be tolerable for someone like me? Thanks so much for your help! Just made these tonight. Accidentally dropped an egg yolk with the white, so 4 eggs, 2 whites, no oil. Oh, they are SO perfect. I made frajitas tonight, but these would be great with anything you would usually stuff in bread or a tortilla. Kinda reminds me of a chalupa from taco bell. 1/4 cup made a 7″ for me, but I made them as thin as I could, spreading the mix out past the edges with a rubber spatula, like a crepe. The mix doesn’t stick. On the spatula like on a spoon either. My doc said low carb is the only way to control my diabetes since the meds don’t bring it down enough, so a big thank you for giving me options that make me feel as though I’m missing nothing! Have a great night! Am looking for a good tortilla sub without nut or coconut flours, so this looked like a great option, except… I am highly intolerant to bovine dairy. I can tolerate some goat and sheep dairy and was wondering whether you thought that goat chèvre could be subbed for the cream cheese? Any other thoughts? I may just give it a whirl and will report back! Thanks. Wow I used these as a wrap for Mississippi Roast and these most the most AMAZING pizza crusts – even from frozen. Thank you so much! Thank you! I so needed this today. I made breakfast tacos and they were delicious. I added a little chili and garlic powder, 3 whole eggs and 2 whites and they came out great! They almost tasted like corn tortillas. Wow, only 1 carb for two wraps- you can’t get any lower than that! I just ate some pork belly (containing the rind) so I’m glad to hear that the rinds have heart-healthy fat- maybe my cholesterol won’t go through the roof afterall. These wraps look delicious, now I’ve got to decide what to fill them with! Would these work as pancakes? would there be an alternative to pork rinds? Hi, I added a bit of dill, salt and garlic powder to a different eggs recipe and the egg disappeared…and they were great. I am of Italian / Mexican decent . You have made me so happy cause I miss the tortillas I used to eat !! Thank you !! HI – just tried this out tonight with fajitas and it was amazing. For the first time in a long time I was able to eat kind of like the normal people do! I have low blood sugar/ hypoglycemia and have to be very careful with the carb count of things. So this is great! Thanks so much for sharing your recipes- I am going to try many more and post them on Facebook for my low carb friends. The recipe makes 8 and I am glad to know they keep for a week in the fridge. I am wondering if they can be toasted? Thank you!! Finally a wrap that my husband loved! They were delicious and they held together when you picked them up (after they cooled). This recipe is a winner! Have you tried making these with BBQ pork rinds? I’m curious how they’d be with pulled pork & cabbage slaw? Hi! This looks great! I am so excited to learn ALL I CAN about low-carb cooking (mostly because I lost 110 lbs with 40 more to go)! I will be trying these real soon, but was wondering how long these would keep in the refrigerator and how? Wow, this is awesome! Total game changer. ? These actually net out to one carb per wrap (.91666). Cream cheese is 8 carbs for 4 oz, no matter the brand, and eggs are .6 carbs each. That said, they have a lot of potential for either savory dishes, or sweet. Thanks for the information, Cindy! I have found that almost any nutrition calculator will vary from another depending on what algorithms are being used to calculate the information. For example, Fatsecret.com lists 1 large egg at .38 carbs each and the USDA lists it as .36 per each. I use a program called MasterCook, I enter my raw ingredients into the program by weight and it calculates the information for me. Is it perfect, no – that’s why I weigh everything and there will always be a difference when compared with another calculator. But, it’s important that people understand why they encounter differences when they enter the ingredients into their own calculators and I thank you so much for bringing this up! Good to know you use Mastercook, it is my digital cookbook of choice. I love all things chicharrone, so thanks for this. These smelled so bad. I have never tried pork rinds until today, but I now know I don’t like them at all. When I cooked the wraps, and the smell lessened. They were flexible, and had a good texture, so, The lesson learned is this: only make theses if you like pork rinds. Made these tonight. Awesome! I did mine in my small omelet pan and tilted the pan like I was making making crepes.. I did the same thing! Hubby and I filled them with a Philly chicken recipe and loved them! Can’t wait to try other fillings. This sounds really good and easy. Definitely going to try them. Would they be good to use to make enchiladas or do you recommend a different recipe? Thank you so much for this recipe! I can’t wait to try them! I live in TX where breakfast tacos are a staple and I need a good tortilla sub!! Has anyone tried corn flavoring in these? I really miss corn tortillas! Canned baby corn processed in the food processor gives the corn flavor with mostly fiber instead of carbs. You could try that. I just made these to use with hot dogs. I used popcorn extract to add some flavor but I don’t think I added enough. They were wonderful! Thank you Kim! I have to try this. Cant use almond flour my daughter is tree nut allergic. Coconut flour recipes make me sick. Can not get around the taste and smell of anything with coconut flour. I am so excited to try these. How long do they keep and how should they be stored? Thank you. when you say TB of cinnamon. Do you mean powder form or extract? Beth, I’m sure it’s ground cinnamon. These look yummy! I will try these soon. I was wondering if you’ve heard of or tried Pea Protein. Used somewhat like whey protein. I just read about it yesterday in a recipe on the Hobbit’s site. It might be another version for wraps! Here’s a link with a description, you can find more on his site. I have heard of pea protein and have seen it in the health food store. Here are my thoughts – knowing that I have never bought pea protein before: Protein powders will work differently based on their composition and properties; whey isolate, casein isolate, whey/casein, egg white, pea protein. Many people think you can just sub one for the other and I’m not entirely convinced that’s true. For example, when you mix casein protein with dairy, it will get really thick like a pudding. Weight lifters like to make it into a “fluff” and have it for dessert. Casein is the protein in milk that often causes inflammation to those who are sensitive to dairy and can cause constipation. Whey protein isolate will never make a thick “fluff” product when mixed with a milk product, but it does give a bit of a drier texture to low carb baked goods which are notoriously moist. I have subbed egg white protein powder for whey protein isolate in a few recipes and noticed that the texture was “off” from a normal texture. BUT, I love using it in non-dairy cheesecake that I make for my daughter with cashews. I like it because it gets thick and sticky and improves the texture nicely. I have no idea how pea protein would react in baked goods nor it’s texture or it’s flavor. I think it’s a great alternative for someone who either can’t have or is trying to avoid it. Perhaps I should buy some and try. I bet it makes a nice protein smoothie. Let me know if you try it and how you like it. I would be interested to hear about it. Thanks again for sharing the site and your comment. Best, Kim. He has a couple of recipes using it. I can’t remember which. I think it’s the protein bar. I agree, I don’t think it could be substituted straight. I use the whey protein in my lc rolls per Maria’s recipe. I’ve been doing them for over a year They are dryer, especially opened and toasted. Just had one tonight with my burger! I’m not one who really misses bread, but my hubby has been happier having one with butter with his breakfast! LOL! Now if there was a good substitute for Italian bread, God would have to make a special place in heaven for that chef! LOL! Thanks for sharing your rccipes! i pre- process my leftover or stale pork rinds and keep them in an air tight container. Hi Suzie. I will address your questions in order…. 1) I did not measure in cups because I used a whole 4 ounce bag. Do you have a scale? If so, measure the ground pork rinds into a bowl until it weighs 4 ounces. I do not have another bag of pork rinds right now or I would find out for you. Sorry, I used them all when testing the recipe. 2) I LOVE Mac’s BBQ pork rinds. I only specified plain in the recipe but I’m sure it would fun to change that up. As far as hidden sugars… they may have them? I would think sugar would have to be labeled on the bag unless it was put in the catch-all “natural flavorings and spices”. If it tastes sweet, it’s probably sugar. I can’t wait to try this recipe, it sounds great! Also, the Mac’s BBQ Pork Rinds do in fact have sugar. I read it in the ingredients list. I believe that they claim to have no carbs which I find hard to believe with the sugar. I wonder if you could Panini them? You could cook both sides of it first, and then fill it to make your panini… that way it gets cooked on both sides before you make it with your fillings! :) These sound wonderful! Can’t wait to try them! The pork rinds I buy have nothing but pork skins — no fillers or other ingredients. It’s the UTZ brand. You can buy a large barrel of them on Amazon. I can’t wait to try this recipe! You can pretty easily find natural pork skins. (Sometimes called work rinds). instead of whole eggs could you use eggs whites? Do they taste eggy?? So often I find recipes like this are overwhelmingly eggy. Hi Kate. Actually, I thought the original recipe was a little eggy. It was a great recipe except for that. That’s why I changed it. I do not think these taste eggy. Having said that, this is a basic recipe that you could jazz-up buy adding garlic powder, Indian spices or anything you wish. I’m planning to do just that as I come up with future recipes for this wrap. Yes, they taste eggy to me. I so wanted to love these, but they tasted like a soggy egg omelet. Sounds super easy!! I can’t wait to try these!